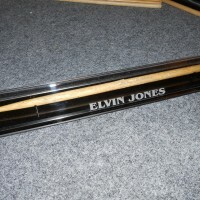 Elvin Jones’ Used Gretsch ELVIN JONES 6D Model Drumstick, Authenticated #2 of 2. 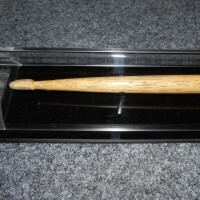 This drumstick was owned and played by Elvin Jones during the 1970s while he was an endorser of the Gretsch Drum Company. Elvin used a few different stick models during his tenure as a Gretsch endorser. I have only 2 of this model stick however the length and printing are slightly on each stick different so I am listing them individually. This stick shows significant signs of wear. Particularly on the tip. 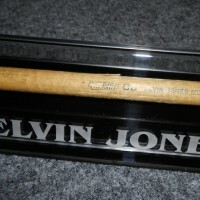 The stick comes with the laser engraved display case shown as well as a certificate of authenticity signed by Elvin’s wife. It is guaranteed authentic. PRICE, $495.00, Includes engraved case and COA.